The 2010 is a quintessentially elegant, classic wine of Bordeaux - firm, rigid, perhaps slightly lighter than most of the other St.-Juliens, but stylish, potentially complex, and reminiscent of the style of the 1986, but more concentrated and powerful. It is a blend of 82% Cabernet Sauvignon, 10% Merlot and 8% Cabernet Franc with a normal pH of 3.56. It was raised in 75% new oak and the alcohol came to 13.7%. This wine displays loads of black currants, cedar wood and vanillin, but needs a good 7-8 years of cellaring, if not much longer. It should last for 30+ years. What I like about tasting at Las Cases is that Jean-Hubert Delon opens one bottle in my presence, and has another already decanted four hours in advance to compare. It is nearly unanimous on each visit that the decanted wine shows better, which probably gives you some insight into the aging potential of Las Cases. It is certainly one of Bordeaux's longest-lived wines, and seems to have more and more of a character resembling Lafite Rothschild more than its nearby neighbor, Chateau Latour. Tasted at the chateau. 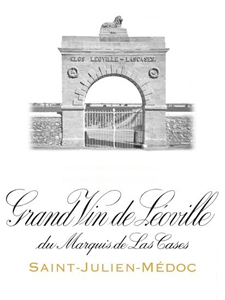 The aromatics on the Leoville Las-Cases 2010 stop you in your tracks: blackberry married with dark plum, Mirabelle, crushed stone and a scent of Christmas cake in the background. It is incredibly well defined and develops subtle floral notes with aeration. The palate is medium-bodied - an immediately elegant, classic Las Cases. It is certainly not the powerhouse that is the 2009, but focused, linear...perhaps athletic and honed. It has outstanding minerality and finesse on the finish to die for. This is an exceptional wine from Jean-Hubert Delon. Tasted November 2012. Cropped at 36.7hl/ha, the Leoville Las-Cases is a blend of 82% Cabernet Sauvignon, 10% Merlot and 8% Cabernet Franc, offering 13.7% alcohol and a pH of 3.56. It will be raised in 75% new oak. The nose is very intense with notes of blackberry, cassis, tobacco and a touch of black truffle, all very well defined and perhaps less generous, but more cerebral than the 2009. The palate is full-bodied with exceptionally silky smooth tannins, wonderful harmony and sense of beguiling composure and completeness. The finish is tannic, driven by the ripe Cabernet Sauvignon. I expect this Las-Cases to close down for a few years...it will need time to mellow and reach its drinking plateau. Drink 2025- Tasted March 2011. Excellent deep crimson. Very introvert and very dry. Super-sweet start and initially seems much rounder and less obdurate than usual. Though those dry tannins certainly creep up on you at the end! Some silkiness and glorying in the special ripeness of the Cabernet in this wine. Very dry end. Not that long funnily enough. A certain transparency that is not usually there. In the last 25 years this has been the top-performing non-1st Growth in the Médoc. The vines are situated alongside those of Chateau Latour and the rigorous pursuit of quality is demonstrated by the demotion of much of the production into the excellent Clos du Marquis. Now the young vines are not even used for Clos du Marquis with the creation of "Le Petit Lion". Lascases will never be cheap but this is a wine that wants to taste like a First Growth and it frequently does. This year however the style seems to have changed with the sometimes monolithic, black, strapping, backward samples of the past replaced by something smoother and more supple. It is still big and dense of course, but less brutal than normal at this stage with an elegant body and a touch of cream and polish. Ripe cassis fills the mouth and there is a plush texture and spicy new oak. The surprise is the finish which seems a little short today. Easier to taste than usual but not quite the beast that we were expecting. Black fruited power is balanced by red fruited freshness a lovely complex mix of flavours. The mid palate is sensuously fleshy the fruit enriched by dark chocolate, coffee beans and liquorice but towards the back there is freshness that gives a lighter feel to the finish. Stunning concentration of fruit, precision and purity, a great vineyard expression and a totally great wine in the most simple sense of the term. Drink 2025-50.